Red Pepper Quilts: The Poseidon Quilt - finished! The Poseidon Quilt - finished! With the pedal to the metal I have finished the Poseidon Quilt. A really simple layout using every single one of the 21 colors in the Kona Cotton Poseidon Fat Quarter bundle, plus I have added the colorway Ash, and have used Snow for sashing. In the bottom left hand corner is the only printed fabric used in this quilt - a floral print by Kaffe Fassett - Line Dance in White. I have quilted it with straight lines both vertically and horizontally, although more of some in one direction than the other. The quilting has added so much character and warmth to the quilt which, although visually the quilt top itself was impressive, it lacked the "wrap up and snuggle now" factor. For binding fabric I have chosen to use a printed fabric, this being a much loved (and often used) Japanese import, Kei Honeycomb in reverse, a grey dot on a white background. And the quilt back: Kona Cotton Ash and some leftover Kona Poseidon pieces. I do love the look of all of those quilting lines intersecting, creating a unique quilt in itself. This was a really simple project, and can be pieced quickly using simple chain piecing techniques. The one thing to be mindful of when sewing this quilt top is to be very accurate when cutting your squares and sashing. If your squares vary in size, your rows just won't line up and as this is such a visually graphic quilt, the unmatched sashing lines are much more obvious than if you are using a busy printed fabric to distract the eye. I have updated my Etsy Store. I'm totally loving this quilt! Stunning. I love the print in the corner. Amazing how you spread out the colors so the eye isn't drawn to a certain spot. This quilt is gorgeous!! I love the blues in it. So pretty!! And I love the straight line quilting. You did a beautiful job on the quilt. Love & blessings from NC! Just stunning! It reminds me of glass tiles on a fresh clean bathroom or kitchen wall. 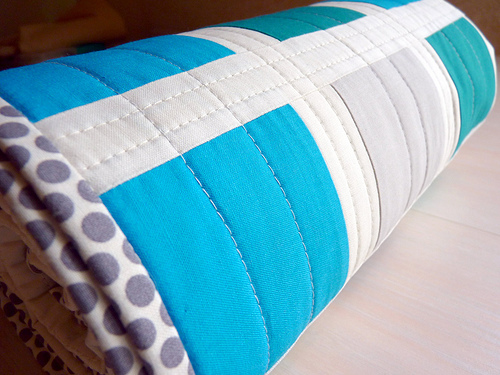 The straight line quilting finishes it so nicely! I love it -- it looks fantastic! Beautiful. I think I look forward to the quilting almost more than the quilts. I think you are the best at the quilting of anyone I have seen in the blogging world. Love it. Why the one printed square? Wow - that is truly spectacular!! 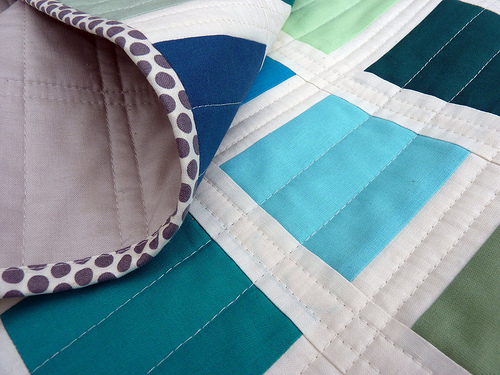 The colors, the quilting, everything just works together in perfect harmony.... Now I want to go out and buy lots of solids!!! This is beautiful and it's about the third time that I've purchased fabric that's just like ones that you have used. Your quilting is truly special. I think this is probably my favourite Red Pepper quilt! Love it Rita, well done! Such a simple yet extremely graphic and interesting quilt. And the Kei sashing it tres magnifique! I love the simple beauty of this but as always, your impecable craftswomanship makes it breathtaking. Wow, if I could only finish a block as quickly as you finish a quilt! What the magic answer? EXACTLY *WHAT* "Mary Grace" SAID! It positively screams GLASS TILES!! Smashing Job! Beautiful! Love the printed fabric in the corner! What a beautiful quilt! I love the bright solids! The quilt looks absolutely wonderful! 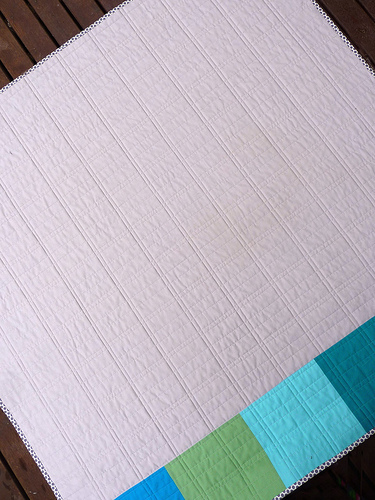 I thought I wouldn't like an all-solids quilt, but you've proved me wrong. :) I LOVE the colours! I'm new here, and new to quilting, but I have to say that is absolutely beautiful! Something to aspire to. Plenty of "wrap up and snuggle now" factor!! Just beautiful Rita and I love the grey binding! I love it, the straight line quilting is fabulous. Beautiful. I love the intersecting quilting lines too. Your sewing accuracy is amazing! Very pretty. Love the shades of blue. Reminds me of the color of the Boise State football team. i've gushed about this quilt before and i will again ... everything is wonderful about this: the colours, the pattern and the quilting you chose. it's so wonderful. Yes, I will definitely make my own. And will use the GO! cutter once I get it from my LQS. 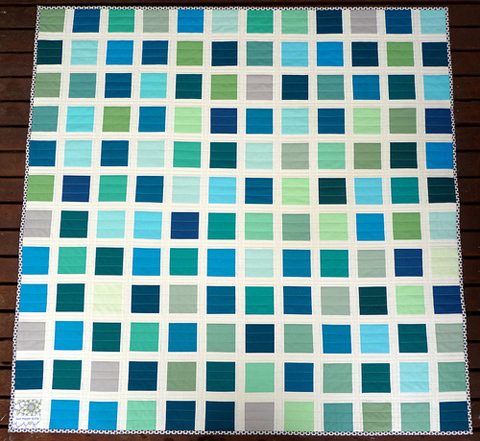 This quilt has made me want to use solids. Did you mention in a previous post where you bought the fabric? I even showed these photos to a quilt shop worker as my inspiration for asking about Jonathan. I definitely would love to have a quilt like this of my own. Super job! 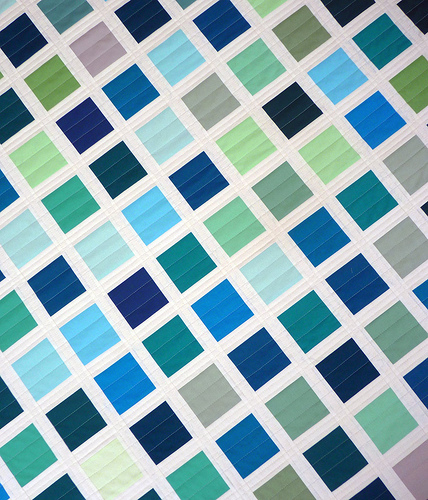 If the ocean floor were tiled, it would look like this ! how are you getting your quilting so straight? are you just using your foot or do you have a guide? This one's just come up so beautifully. I love it. I love love love this! Such a calming quilt! I'm not sure if I'm more impressed with the way the color "reflects" off the quilt, or the really impressive stitches straight across. It really gives it an "ocean" feel. Can I tell you how much I LOVE that quilt!!!??? Stunning. I'm a sucker for simplicity of design -- especially when paired with your awesome quilting skills! 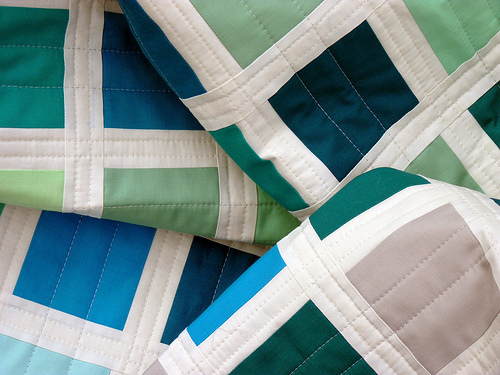 When I saw the picture of this quilt I knew I wanted to do something similar, solids enhanced by white sashing. It's is still in progress but there will be a final reveal on my blog giving you full credit for the inspiration. I truly love what you do !